Relaxation and peace of mind are very necessary for the busiest schedules and modern lifestyle of crowded cities like Noida. The luxury lifestyle is a part of excitement and enjoyment but for healthy living, green living features are essential. Implementing this great deal with serious executions of pleasant natural surrounding and superb green living facilities, ATS Rhapsody Greater Noida West has launched its tremendous range of luxury abodes in Sector 10, Noida Extension. The Wi-Fi enabled complex has wonderful highlights including RO plant for drinking water in each apartment. There is a nursery school, religious building, nursing homes and a petrol pump in the complex. There are beautiful flowers, green gardens, Zen Parks, prosperous trees, comfortable sit out zones and many other useful green living features. The building is unique in its category as it has magnificent architectural designs and superb interiors. The 2 and 3 BHK apartments in the premises have study rooms, stylish bedrooms, modular kitchens, spacious balconies, and many other top-notch specifications. The apartments are well-spacious and designed with finely crafted interiors. Providing ample cross-ventilation for fresh air and natural daylight, the premium units are Vaastu friendly and earthquake resistant. The apartment complex is loaded with supreme amenities like swimming pool and radiant club with reading room, constant water and power supply, community hall, shopping complex, hi-tech security, tennis and badminton courts, central lawns and much more. The metro connectivity is just 1 kilometer off the complex. Apart from that, the township provides easy access to major schools, malls, industrial hubs, etc. The connectivity is very smooth from here to Delhi by DND Flyover, Expressway, and Highway. 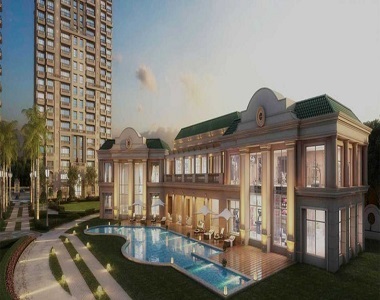 The reasonable prices set here for the sale of luxury apartments are easily affordable for budget buyers.